In the interest of the users of the financial statements, the standard setting bodies and regulatory authorities prescribe the required disclosures in the financial statements for related party relationships, transactions and balances. The Securities and Exchange Commission (SEC) issued Financial Reporting Bulletin No. 13, Presentation of Related Party Disclosures, dated January 24, 2013, to further clarify the disclosure required by PAS 24. Related parties in the parlance of financial reporting is a wide concept. Businesses keeps expanding and to achieve maximum results, they form, acquire or engage new companies and individuals to help them either finance or manage their operations. Behind the operational complexities, there are certain disclosures required in financial reporting, specifically by Philippine Accounting Standard (PAS) 24, Related Party Disclosures. The main point clarified by this financial reporting bulletin is that the disclosures should be presented in columnar format. Of course, Financial Reporting Bulletin No. 13 also reiterate the required items to be disclosed. 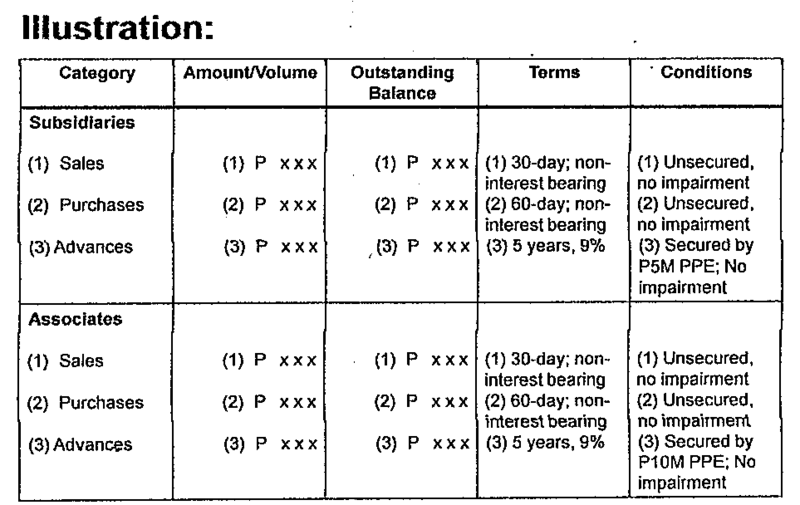 In addition to the above tabular/columnar format disclosure, the company also need to disclose the terms and conditions, including whether they are secured, and the nature of the consideration to be provided in settlement, and details of any guarantees given or received; provisions for doubtful debts related to the amount of outstanding balances; the expense recognized during the period in respect of bad or doubtful debts due from related parties. These can be disclosed in narrative. During the presentation of the SEC General Accountant during her talk on “Update on Financial Reporting Regulations” for Finex last February 20, 2013, an illustration of the related party disclosure was shown. Please see illustration below. I believe that this illustration was the preference of the SEC and expects filers to adopt this format. However, in certain circumstances where another presentation is necessary (as illustrated above) in order to understand more the impact of the related party transactions, the entity can modify this format. The main objective is really to present the potential effect of the relationship of related parties in the financial statements. Just recently, the Bureau of Internal Revenue issued Revenue Regulations (RR) No. 2-2013: Transfer Pricing Guidelines which, as the title suggests, provides guidelines for transfer pricing and is applicable to cross-border transactions between associated enterprises and domestic transactions between associated enterprises. You can read more of Revenue Regulations (RR) No. 2-2013: Transfer Pricing Guidelines, click this link. It is noted that regulators (SEC and BIR) have increased scrutiny over related party transactions as these there is a huge possibility that these can be a source of fraud in financial reporting and taxation. (d) the expense recognized during the period in respect of bad or doubtful debts due from related parties. 3. The presentation shall be made in columnar format according to the above categories and disclosure items.